This name uses Portuguese naming customs. The first or maternal family name is Barbosa and the second or paternal family name is de Oliveira. Born in Maceió, Alagoas, Firmino joined Figueirense's youth setup in 2008, aged 17, after starting out at CRB. He was discovered by a dentist, Marcellus Portella. With the latter, he was mainly used as a defensive midfielder. Firmino made his professional debut on 24 October 2009, coming on as a half-time substitute for Toninho in a 1–2 home loss against Ponte Preta, for the Série B championship. In January 2010 he was promoted to the main squad. Firmino scored his first professional goal on 8 May 2010, netting the winner in an away success against São Caetano. He contributed with eight goals in 36 appearances during the season, as Figueira returned to Série A after a two-year absence. Firmino signed with Hoffenheim in December 2010, with the contract running until June 2015. He formally arrived at Hoffenheim on 1 January 2011. Then Hoffenheim manager Ernst Tanner commented that they were "pleased to hire a Brazilian talent". He made his debut a month later in a Bundesliga defeat against Mainz, where he came on as a 75th-minute substitute for Sebastian Rudy. He scored his first goal for the club on 16 April, the only goal of a league victory against Eintracht Frankfurt. He was dropped from the first-team squad along with Chinedu Obasi at the end of November 2011 for showing up late for training, missing the league match against Bayer Leverkusen. He scored two more goals that season, against Wolfsburg and Borussia Mönchengladbach. In the 2012–13 season, Firmino made 36 appearances and scored seven goals. In July 2013, Russian club Lokomotiv Moscow made a €12 million bid for Firmino. Hoffenheim captain Andreas Beck hailed Firmino's development as "outstanding" in August 2013. On 27 March 2014, Firmino extended his contract with the club, signing a three-year extension. He finished the 2013–14 Bundesliga season tied as the fourth highest scorer with 16 goals, and was named the league's Breakthrough Player. 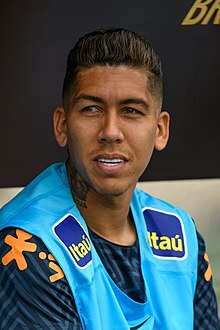 On 23 June 2015, while he was competing for Brazil at the Copa América, Hoffenheim and Firmino agreed terms for him to transfer to Premier League club Liverpool for up to £29 million on conclusion of the tournament, subject to a work permit. Liverpool confirmed the signing the following day, subject to a medical. The deal was finalised on 4 July. Firmino made his Liverpool debut in a pre-season friendly away to Swindon Town on 2 August, and his league debut a week later, replacing Jordon Ibe for the final 12 minutes of a 1–0 win at Stoke City. On 21 November, Firmino scored his first goal for Liverpool in a 4–1 victory over Manchester City at the City of Manchester Stadium. In January 2016, Firmino was described by Paul Little of the Irish Examiner as steadily improving during his first season in England, although an inability to combine with centre forward Christian Benteke drew criticism. However, in 2016, Firmino's form improved as manager Jürgen Klopp played him alone up front in a False 9 role. He scored braces against Arsenal and Norwich City that month; the latter performance, in which he also assisted in a 5–4 win, earned comparisons to Raheem Sterling. With his form improved, Firmino was voted to be Liverpool's Player of the Month in January. Firmino ended the season as Liverpool's league top scorer with ten goals. Firmino playing for Liverpool during a Premier League match against Chelsea on 31 January 2017. On 23 August, Firmino scored his first goal of the 2016–17 season, scoring in a 5–0 win over Burton Albion in the second round of the EFL Cup. Firmino scored his first league goals of the season in a 4–1 win over Leicester City, scoring a brace, on 10 September. On 29 October, Firmino scored in a 4–2 win over Crystal Palace, and on 6 November he scored in a 6–1 over Watford; the latter result saw Liverpool move to 1st position in the league table, the first time under Klopp. On 27 December, he scored in a 4–1 win over Stoke City. On 21 January 2017, Firmino scored a brace in a 2–3 home defeat to Swansea City. On 4 March, he scored the opening goal in a 3–1 win over Arsenal. On 8 April, Firmino scored the winning goal in a 2–1 win over Stoke City, and also scored the winning goal in the game against West Bromwich Albion, which Liverpool won 1–0, on 16 April. Firmino finished the season with 12 goals in 38 appearances. Firmino with Liverpool during a UEFA Champions League match against Spartak Moscow in 2017. Before the start of the 2017–18 season, Firmino switched his shirt number to 9, with new signing Mohamed Salah taking his number 11. Firmino scored his first goal of the new season on 12 August, scoring a penalty in a 3–3 draw with Watford. On 23 August, Firmino scored in a 4–2 win over Hoffenheim in the second leg of the UEFA Champions League play-off, with Liverpool winning 6–3 on aggregate to qualify for the 2017–18 UEFA Champions League group stage. On 27 August, he scored the opening goal in a 4–0 win over Arsenal. On 13 September, Firmino scored and missed a penalty in a 2–2 draw with Sevilla in the first match of the Champions League. On 17 October, Firmino scored twice in a 7–0 Champions League away win over Maribor, helping Liverpool to the joint-largest away win of the competition; and the largest away win by an English club. On 28 October, Firmino scored in a 3–0 win over Huddersfield Town. On 21 November, he scored twice in a 3–3 draw with Sevilla in the Champions League. On 2 December, Firmino scored twice in a 5–1 away win over Brighton & Hove Albion. On 6 December, he scored in a 7–0 win over Spartak Moscow in the Champions League. On 17 December, he scored in a 4–0 away win over Bournemouth; a result which saw Liverpool become the first team in Premier League history to win four consecutive away games by a margin of at least three goals. On 22 December, Firmino scored the equalizing goal in a 3–3 away draw with Arsenal. On 26 December, Firmino scored twice in a 5–0 win over Swansea City. On 5 January 2018, during a FA Cup match against rivals Everton, Firmino was the subject of controversy following a clash with Everton defender Mason Holgate. Holgate pushed Firmino into the advertising boards, which was followed by the pair exchanging words, with Firmino seemingly insulting the player. Following the match, Holgate accused Firmino of racially abusing him, which he denied. A day later, the Football Association opened an investigation on the matter. Nearly two months later, after they had took statements from 12 different players, several referees and consulted two Portuguese lip-readers, the Football Association cleared Firmino of any offence as a result of "insufficient evidence". On 14 January, Firmino scored in a 4–3 home win over Manchester City; which saw Liverpool end City's unbeaten league run. On 27 January, Firmino scored and missed a penalty in a 2–3 defeat to West Bromwich Albion in the fourth round of the FA Cup. On 30 January, he scored in a 3–0 away win over Huddersfield Town. On 11 February 2018, Firmino scored in a 2–0 away win over Southampton. On 14 February, Firmino scored in a 5–0 away win over Porto in the first leg of the Champions League round of sixteen. On 24 February, he scored in a 4–1 win over West Ham United. On 17 March, he scored in 5–0 win over Watford. On 10 April, he scored in a 2–1 win over Manchester City in the second leg of the quarter-finals of the Champions League; which saw Liverpool advance to the semi-finals with a 5–1 aggregate win. Four days later, on 14 April, he scored in a 3–0 win over Bournemouth. On 24 April, he scored twice in Liverpool's 5–2 win over Roma in the first leg of the Champions League semi-finals. On 29 April, Firmino signed a new long-term contract with Liverpool. Firmino started and played the whole 90 minutes in the 2018 UEFA Champions League Final, with Liverpool losing 3–1. During the season, Firmino, Mohamed Salah, Philippe Coutinho and Sadio Mané made up a prolific attacking quarter, dubbed the "Fab Four", in reference to the rock band The Beatles, also from the same city as the club. Following the mid-season exit of Coutinho, the three remaining players were dubbed as the "Fab Three", with the trio having a total of 91 goals between them at the end of the season. Firmino was Liverpool's joint top goalscorer in the UEFA Champions League, together with Salah, with 11 goals. Firmino was also included in the 2017–18 UEFA Champions League Squad of the Season. The 2017–18 season was Firmino's most prolific in his Liverpool career; as he scored 27 goals in all competitions. After going goalless in all three matches played in August, Firmino scored his first goal of the season in a 2–1 Premier League win over Leicester City on 1 September. On 15 September he scored in Liverpool's 2–1 league win over Spurs at Wembley, a game that saw him leave the field 15 minutes before the end with an eye injury. Three days later he came off the bench to score the stoppage time winner in Liverpool's 3–2 Champions League win against Paris Saint-Germain at Anfield. On 29 December, Firmino scored his first Liverpool hat-trick in a 5–1 win over Arsenal, scoring two goals in three minutes and a second half penalty, becoming the highest scoring Brazilian player in Premier League history. On 19 January 2019, he scored Liverpool's 1000th goal at Anfield in the Premier League era when he netted in a 4–3 win over Crystal Palace. Firmino said that it was his "dream" to play in the national team though he had no "contact with national team manager Dunga". On 23 October 2014, Firmino received his first call up to Brazil national football team for the friendly matches against Turkey and Austria. He commented, "I'm very happy about the nomination and would especially like to thank the team". He debuted in a 4–0 win over Turkey on 12 November, replacing fellow debutant Luiz Adriano for the last 17 minutes. Firmino scored his first goal six days later in the latter match, a 2–1 away win. In May 2015, Firmino was included in Brazil's 23-man squad for the 2015 Copa América to be held in Chile. On 21 June, he scored in a 2–1 defeat of Venezuela to qualify the Seleção for the knockout stage as Group C winners. In May 2018 he was named in Tite's final 23 man squad for the 2018 World Cup in Russia. On 2 July, Firmino scored Brazil's second goal in a 2–0 win over Mexico in the round of sixteen having come on as a late substitute. Firmino is known for his creativity, link-up play, goalscoring and workrate. At Hoffenheim, Firmino primarily played as an attacking midfielder, but was also utilised as a forward, winger or central midfielder, with Firmino using his speed, close control and vision wherever he is deployed. After initially starting as a left winger at Liverpool under Brendan Rodgers, new manager Jürgen Klopp utilised Firmino more centrally, initially as a False 9. However, after impressing under Klopp's pressing system, Firmino established himself as Liverpool's first choice centre-forward by the 2017–18 season. Ian Doyle of the Liverpool Echo referred to him as "a true Liverpool number nine", whose "numbers are up there with Harry Kane and Sergio Agüero." Ryan Babel, a teammate of Firmino's at Hoffenheim, described him as "A tricky player. He can dribble, shoot, he has a great shot, he can play a lot of through balls and his assists are very good", while also praising a heading ability which would not be common amongst other players of Firmino's stature. Babel also stated that Firmino had a humble mentality and no problems with attitude. In addition to his technical skills, creativity, link-up play, and goalscoring, Firmino has also been praised by his managers, teammates, and pundits for his positional sense, intelligent movement, and ability to make attacking runs off the ball, which often draws opposing players out of position and creates space for his teammates. Due to his energy and defensive work-rate off the ball, Klopp has referred to Firmino as the "engine" that propels the team's relentless counter-attacking system; "If he loses the ball, he fights for it back. If he loses it again, he fights for it. He looks like the engine of the team." The suitability of Firmino's playing style to Klopp's pressing system has meant that Firmino was referred to as "Liverpool's most important player" on several occasions during the 2016–17 and 2017–18 seasons. Firmino is also well known for his popular "no-look" goals. One of his best known goal celebrations, 'the Matador', features in the FIFA video game FIFA 19. Firmino married Larissa Pereira in his hometown in June 2017. They have two daughters. Firmino has been given the affectionate nickname "Bobby" by Liverpool fans and players – a shortening of his first name "Roberto". In December 2016, Firmino was arrested for drink driving. He was fined £20,000 and had his driving licence revoked for a year when sentenced at Liverpool Magistrates' Court in February 2017. ^ a b c d e f g Roberto Firmino at Soccerway. Retrieved 22 October 2017. ^ "2018 FIFA World Cup: List of players" (PDF). FIFA. 21 June 2018. p. 4. ^ a b "Klopp: What can I say about Firmino? He's like the engine of the team". liverpoolfc.com. Liverpool Football Club. Retrieved 5 December 2017. ^ "De volante no CRB a alvo de ingleses, Firmino emociona amigo de Maceió" [From a defensive midfielder at CRB to English clubs' target, Firmino thrills a friend from Maceió] (in Portuguese). Globo Esporte. 22 June 2015. Retrieved 23 June 2015. ^ "Firmino was destined for top". Daily Mirror. 28 June 2015. Retrieved 29 June 2015. ^ "Primeiro técnico de Firmino no CRB rasga elogios e revela: "Era volante"" [Firmino's first manager at CRB praises him and reveals: "He was a defensive midfielder"] (in Portuguese). Globo Esporte. 11 June 2015. Retrieved 23 June 2015. ^ "Figueirense perde para a Ponte Preta e vê G-4 se distanciar" [Figueirense loses to Ponte Preta and sees G-4 more distant] (in Portuguese). ZH Esportes. 24 October 2009. Retrieved 23 June 2015. ^ "Figueirense estreia com vitória em cima do São Caetano" [Figueirense debuts with victory over São Caetano] (in Portuguese). ESPN Brasil. 8 May 2010. Retrieved 23 June 2015. ^ "Official: Hoffenheim Sign Roberto Firmino From Figueirense". Goal.com. 14 December 2010. ^ "Hoffenheim contrata Roberto Firmino, do Figueirense" [Hoffenheim sign Figueirense's Roberto Firmino]. Esportes Estadao. Retrieved 31 March 2015. ^ "Eintracht stürzt weiter ab". FR-Online. Retrieved 27 March 2015. ^ "Chinedu Obasi dropped from Hoffenheim squad". BBC Sport. 30 November 2011. ^ "1899 Hoffenheim: Geht Roberto Firmino nach Russland?" (in German). T-Online. 5 July 2013. Retrieved 8 January 2018. ^ "Roberto Firmino: "Ich bin wie befreit"". Kicker. Retrieved 27 March 2015. ^ "Roberto Firmino verlängert Vertrag bis 2017". TSG 1899 Hoffenheim (in German). 27 March 2014. ^ a b "Breakthrough of the Season". bundesliga.com. 23 May 2014. Retrieved 23 May 2014. ^ Smith, Ben (23 June 2015). "Roberto Firmino: Liverpool agree £29m deal for Brazil striker". BBC Sport. Retrieved 23 June 2015. ^ Carroll, James (24 June 2015). "Liverpool complete Firmino signing". Liverpool FC. Retrieved 24 June 2015. ^ a b Jones, Neil (4 July 2015). "Roberto Firmino will bring joy to Liverpool FC fans, says Ryan Babel". Liverpool Echo. Retrieved 4 July 2015. ^ Jones, Neil (2 August 2015). "Christian Benteke: Liverpool striker scores in Swindon friendly". BBC Sport. Retrieved 5 August 2015. ^ Hafez, Shamoon (9 August 2015). "Stoke 0–1 Liverpool". BBC Sport. Retrieved 9 August 2015. ^ "Manchester City 1–4 Liverpool: Jurgen Klopp masterminds stunning win". Sky Sports. Retrieved 11 March 2016. ^ Little, Paul (22 January 2016). "Klopp must counter cultural legacy to free Benteke potential". Irish Examiner. Retrieved 24 January 2016. ^ "Jurgen Klopp says Christian Benteke has Liverpool future". Sky Sports. 20 January 2016. Retrieved 24 January 2016. ^ Rej, Arindam (23 January 2016). "Norwich 4 Liverpool 5: five things we learnt". The Daily Telegraph. Retrieved 24 January 2016. ^ Ankers, George (23 January 2016). "Is Roberto Firmino finally paying off Liverpool's £29m investment?". Goal.com. Retrieved 24 January 2016. ^ "Firmino picks up first Player of the Month award". 4 February 2016. ^ "All Games Goalscorers 2015–2016". LFCstats. 15 May 2016. Retrieved 4 October 2016. ^ "Burton Albion 0–5 Liverpool". BBC Sport. 23 August 2016. Retrieved 7 July 2018. ^ "Liverpool 4–1 Leicester City". BBC Sport. 10 September 2016. Retrieved 7 July 2018. ^ "Crystal Palace 2–4 Liverpool". BBC Sport. 29 October 2016. Retrieved 7 July 2018. ^ "Liverpool 6–1 Watford". BBC Sport. 6 November 2016. Retrieved 7 July 2018. ^ "Liverpool 4–1 Stoke City". BBC Sport. 27 December 2016. Retrieved 7 July 2018. ^ "Liverpool 2–3 Swansea City". BBC Sport. 2017. Retrieved 7 July 2018. ^ "Liverpool 3–1 Arsenal". BBC Sport. 4 March 2017. Retrieved 7 July 2018. ^ "Stoke City 1–2 Liverpool". BBC Sport. 8 April 2017. Retrieved 7 July 2018. ^ "West Bromwich Albion 0–1 Liverpool". BBC Sport. 16 April 2017. Retrieved 7 July 2018. ^ "LFC Stats – Liverpool FC 2016/2017 All Appearances – Roberto Firmino". lfcstats.co.uk. Retrieved 7 July 2018. ^ "Mohamed Salah's LFC squad number confirmed". Liverpool FC. Retrieved 7 July 2018. ^ "Watford 3–3 Liverpool". BBC Sport. 12 August 2017. Retrieved 7 July 2018. ^ "Liverpool 4–2 1899 Hoffenheim (agg 6–3)". BBC Sport. 23 August 2017. Retrieved 7 July 2018. ^ "Liverpool 4–0 Arsenal". BBC Sport. 27 August 2017. Retrieved 7 July 2018. ^ "Liverpool 2–2 Sevilla". BBC Sport. 13 September 2017. Retrieved 7 July 2018. ^ "NK Maribor 0–7 Liverpool". BBC Sport. 17 October 2017. Retrieved 7 July 2018. ^ Burnton, Simon (17 October 2017). "Maribor 0–7 Liverpool: Champions League – as it happened". The Guardian. ISSN 0261-3077. Retrieved 7 July 2018. ^ "Liverpool 3–0 Huddersfield Town". BBC Sport. 28 October 2017. Retrieved 7 July 2018. ^ "Sevilla 3–3 Liverpool". BBC Sport. 21 November 2017. Retrieved 7 July 2018. ^ "Liverpool 7–0 Spartak Moscow". BBC Sport. 6 December 2017. Retrieved 7 July 2018. ^ "Liverpool news: Jurgen Klopp's side make history with record away day goal tally after 4–0 win at Bournemouth | Goal.com". Retrieved 7 July 2018. ^ "Key Stats From Bournemouth 0–4 Liverpool". AnfieldIndex.com. Retrieved 7 July 2018. ^ "Bournemouth 0 Liverpool 4: Reds run riot on the south coast". Evening Standard. Retrieved 7 July 2018. ^ Smyth, Rob (22 December 2017). "Arsenal 3–3 Liverpool: Premier League – as it happened". The Guardian. ISSN 0261-3077. Retrieved 7 July 2018. ^ "Arsenal 3–3 Liverpool". BBC Sport. 22 December 2017. Retrieved 7 July 2018. ^ "Liverpool 5–0 Swansea: Roberto Firmino nets twice in routine win". Sky Sports. Retrieved 7 July 2018. ^ "Liverpool 2–1 Everton". BBC Sport. 2018. Retrieved 12 August 2018. ^ Hunter, Andy (6 January 2018). "FA to investigate racism allegations after Firmino and Holgate flare-up". the Guardian. Retrieved 12 August 2018. ^ Hunter, Andy (21 February 2018). "Roberto Firmino cleared by FA over Mason Holgate racism allegations". the Guardian. Retrieved 12 August 2018. ^ "Roberto Firmino breaks silence on Mason Holgate clash after being cleared of racist abuse". The Independent. Retrieved 12 August 2018. ^ "Statement from Roberto Firmino". Liverpool FC. Retrieved 12 August 2018. ^ "Liverpool 4–3 Manchester City". BBC Sport. 2018. Retrieved 7 July 2018. ^ "Liverpool 2–3 West Bromwich Albion". BBC Sport. 2018. Retrieved 7 July 2018. ^ "Huddersfield 0–3 Liverpool". Mail Online. Retrieved 7 July 2018. ^ "Southampton 0–2 Liverpool: Firmino and Salah score". Mail Online. Retrieved 7 July 2018. ^ Murray, Scott (14 February 2018). "Porto 0–5 Liverpool: Champions League – as it happened". The Guardian. ISSN 0261-3077. Retrieved 7 July 2018. ^ "Liverpool 4–1 West Ham United". BBC Sport. 24 February 2018. Retrieved 7 July 2018. ^ "Liverpool 5–0 Watford". BBC Sport. 17 March 2018. Retrieved 7 July 2018. ^ "Manchester City 1–2 Liverpool". BBC Sport. 10 April 2018. Retrieved 7 July 2018. ^ Smyth, Rob (14 April 2018). "Liverpool 3–0 Bournemouth: Premier League – as it happened". The Guardian. ISSN 0261-3077. Retrieved 7 July 2018. ^ "Liverpool 5–2 Roma: Mo Salah scores twice in Champions League semi-final first leg". Sky Sports. Retrieved 7 July 2018. ^ a b "Roberto Firmino agrees terms on new long-term LFC deal". Liverpool FC. Retrieved 7 July 2018. ^ Pearce, James (29 April 2018). "Roberto Firmino kicks off Liverpool's huge week in the best way". liverpoolecho. Retrieved 7 July 2018. ^ "Real Madrid 3–1 Liverpool". BBC Sport. 26 May 2018. Retrieved 7 July 2018. ^ Smyth, Rob (26 May 2018). "Real Madrid beat Liverpool 3–1 to win Champions League final 2018 – as it happened". The Guardian. ISSN 0261-3077. Retrieved 7 July 2018. ^ "Liverpool team news: Fab Four start at Arsenal with Oxlade-Chamberlain on the bench | Goal.com". Retrieved 7 July 2018. ^ "The Fab Three? Liverpool better equipped to cope with Coutinho exit after Suarez experience". FourFourTwo. 7 January 2018. Retrieved 7 July 2018. ^ "'Fab Three' make Liverpool dangerous outsiders to win Champions League". The National. Retrieved 7 July 2018. ^ "Liverpool's fab three: Only PSG's MCN have more goals than Salah, Mane and Firmino – MARCA in English". MARCA in English. Retrieved 7 July 2018. ^ "UEFA Champions League | Player statistics of 2017/2018 season | Europe | World Football". www.worldfootball.com. Retrieved 7 July 2018. ^ UEFA.com. "UEFA Champions League Squad of the Season". UEFA.com. Retrieved 7 July 2018. ^ Murray, Scott (1 September 2018). "Leicester City 1–2 Liverpool: Premier League – as it happened". The Guardian. ISSN 0261-3077. Retrieved 7 September 2018. ^ "Liverpool beat Tottenham Hotspur 2–1 to maintain 100% Premier League start". BBC. Retrieved 18 September 2018. ^ "Firmino strike sees Liverpool win five-goal thriller at Anfield". BBC. Retrieved 18 September 2018. ^ "Liverpool 5–1 Arsenal: Roberto Firmino hits hat-trick as Jurgen Klopp's side thrash Arsenal". BBC Sport. 29 December 2018. Retrieved 30 December 2018. ^ "Firmino: "Ich will noch viel mehr"". Kicker. Retrieved 27 March 2015. ^ "Dunga beruft Roberto Firmino in die Seleçao". Kicker. Retrieved 27 March 2015. ^ "Roberto Firmino feiert Debüt bei Neymar-Show". Kicker. Retrieved 27 March 2015. ^ "Roberto Firmino strikes late winner". BBC. Retrieved 27 March 2015. ^ "Brazil v Venezuela: 2–1 win sees Dunga side progress in Copa America despite Neymar absence". Fox Sports. 22 June 2015. ^ "World Cup: Neymar named in Brazil's 23-man squad". BBC Sport. 14 May 2018. ^ "Roberto Firmino Player Profile – ESPN FC". www.espnfc.us. ^ "Brazil beat Mexico to reach last 8". BBC. 2 July 2018. ^ "Roberto Firmino". National Football Teams. Benjamin Strack-Zimmerman. Retrieved 28 July 2015. ^ "Roberto Firmino". liverpoolfc.com. Liverpool Football Club. Retrieved 19 March 2016. ^ "How Firmino's excellent false nine display almost led Liverpool to victory". FourFourTwo.com. FourFourTwo. Retrieved 12 February 2018. ^ "Why there's nothing false with Roberto Firmino being Liverpool's new number nine". Liverpool Echo. Retrieved 12 February 2018. ^ "Roberto Firmino is now a true Liverpool number nine – and his numbers are up there with Harry Kane, Sergio Aguero and Alvaro Morata". Liverpool Echo. Retrieved 13 August 2018. ^ a b c Bull, J. J. (10 August 2017). "Why Roberto Firmino is so key to Liverpool's heavy metal style of play". The Telegraph. ^ a b Critchley, Mark (23 August 2017). "Hoffenheim and the man who discovered Roberto Firmino must now try to stop him and Liverpool". The Independent. Retrieved 16 October 2018. ^ Adrian Clarke (3 February 2018). "Firmino and Kane deadly in different ways". www.premierleague.com. Retrieved 16 October 2018. ^ Haugstad, Thore (18 January 2016). "Man United overcome Liverpool's high pressing as Roberto Firmino links play". ESPN FC. Retrieved 16 October 2018. ^ Michael Cox (17 January 2017). "Eden Hazard, Roberto Firmino and Christian Eriksen: The PL's key players". ESPN FC. Retrieved 16 October 2018. ^ "Roberto Firmino's no-look finishes are exactly the arrogance football needs". Planet Football. 19 March 2018. Retrieved 7 September 2018. ^ "Roberto Firmino: Liverpool's no-look Brazilian magician, made in the Bundesliga". bundesliga.com – the official Bundesliga website. Retrieved 7 September 2018. ^ "Pôr do sol, flores e jogadores do Liverpool: Roberto Firmino se casa em Maceió" (in Portuguese). Globo. 20 June 2017. Retrieved 8 January 2018. ^ "Games played by Roberto Firmino in 2015/2016". Soccerbase. Centurycomm. Retrieved 22 October 2017. ^ "Games played by Roberto Firmino in 2016/2017". Soccerbase. Centurycomm. Retrieved 22 October 2017. ^ "Games played by Roberto Firmino in 2017/2018". Soccerbase. Centurycomm. Retrieved 22 October 2017. ^ "Games played by Roberto Firmino in 2018/2019". Soccerbase. Centurycomm. Retrieved 12 August 2018. ^ "Roberto Firmino". National Football Teams. Benjamin Strack-Zimmerman. Retrieved 15 June 2015. ^ "Roberto Firmino wins the 2018 Samba Gold". sambafoot.com. 3 January 2019. Retrieved 3 January 2019. Wikimedia Commons has media related to Roberto Firmino. This page was last edited on 21 April 2019, at 08:00 (UTC).